I have been scouring Halloween editions of magazines and Pinterest for easy Halloween snacks to serve at O's first birthday party. Here are a couple I've practiced recently. First, I attempted bite-sized caramel apples. I had seen this pin that involved a melon baller and drizzled caramel, and that sounded too complicated for me! So I planned to cut the apples into bite-size chunks and dip them in melted butterscotch chips. It was all going well until I got to the melting part. It is definitely not as easy as the directions on the bag make it seem! I burned the first 2 batches (melting in my microwave was NOT working & on the stove requires A LOT of attention). For my third attempt, I constantly stirred while I melted them in a double boiler until it was smooth. But when I took it off the heat, it immediately started thickening. I couldn't put it back on the heat & dip, because if I stopped stirring, it burned. So it ended up pretty lumpy, but very yummy. Since that wasn't the look I was going for, I picked up these mixes at the store hoping to simplify things. I read a tip to dry the apple pieces to help the caramel stick, but caramel did still pool at the bottom a bit more than I would like. I'm going to try using less next time to make it lighter. The candy hardened nicely, and the pieces are much easier to eat than a whole candy apple. For O's party, I'm going to decorate the sticks with witch printables (found here & shrunk to 25%). 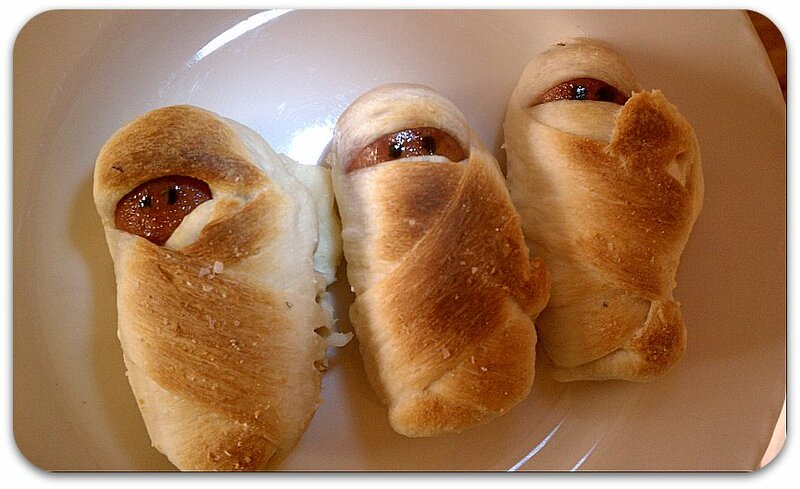 And even easier are the Mummy Dogs (another idea from a pin). You just cut hot dogs in half, wrap them in Pillsbury breadstick dough, and bake according to the breadstick directions. I sprinkled garlic salt & garlic powder on top before I baked them & finished them off with food coloring eyes. Any other pins I should be trying out? I am TOTALLY making those mummy dogs for my Halloween party - except I was trying to figure ouw where to buy tiny hot dogs, instead of just thinking CUT THEM IN HALF. It's amazing I don't forget to breath some days. Buffalo wild wings might sell you the shorter dogs. FYI... Not sure where you live, but in Publix (Florida's grogery store) you can buy cocktail weiners in the same section as the regular hotdogs. Nathan's makes them. They're delicious and the perfect size! Cutting the big ones in half works too, but then they're still kinda big. the little cocktail weiners are sooooo cute!! love the mummy dogs! ive always wanted to make those. this is my year, i swear. Can't wait to try the apple bites. If you still want to make the butterscotch ones, try adding a little shorting in. It keeps the sauce thin. I did pretzel sticks dipped in white chocolate - dip about 2/3 in the white chocolate then add mini chips for the eyes - cool ghosts. Also - if your chocolate is not melting (I highly recommend the double boiler method over the microwave) add a teaspoon of shortening (1 at a time) until it reaches the right smooth consistency. The candy apple bites looked like so much fun, so I decided to make them for a party. Everything was going so well--I was cutting up my Granny Smith's, the candy was boiling, and I was following the instructions exactly as they said on the box (I bought the $0.99 red ones you pictured above.) The kitchen smelled amazing. However, I learned realllllly quickly that A) I must've done something horribly wrong or B) these candy apples were a bust. Perhaps if I did the caramel, I'd have been in better shape, but as pretty as they look, and as novel of an idea that it is, I certainly don't suggest making the red candy apple. The shell was hard as a rock and the exposed apple turned to mush. I was also trying to be a prepared host and made them the night before, but even then, it said I cannot refrigerate the mix. Oh well, lesson learned. Or perhaps not. Because I'm still curious as to how the caramel ones turned out. @AnonymousSorry they didn't work out for you. I didn't have any issues with sticking or taste, and I've made these twice. Maybe the candy burned? Or the box was old? Using cut up apples shouldn't affect the taste/stickiness of the candy. We make the mummy dogs as a whole hotdog, slice of cheese & wrap it in a croissant. Just before serving, we dot on mustard eyes! So yummy! Can't wait to try these apples tomorrow! @CarolThanks so much, Carol! There is a great video at that link too! I tried the butterscotch chips but couldn't keep it from burning. This just motivated me to try again! Just added a melting pot to my shopping list. Can't wait to try it! did anyone try the crockpot on low heat to melt the chips? I was wondering if you could take caramel candy pieces and slightly melt til soft in microwave and then stick apple w/ toothpick in it. Also, you can make spiders by using chow mein noodles as legs on an open face Ritz cracker topped w/ peanut butter and either mini choc chips for eyes or raisins. Kraft makes caramel bits (tiny little balls) for baking. I'll bet they would be great for melting down for your bite-sized caramel apples! When I make "buckeyes", I add a little parafin to the chocolate (or in this case butterscotch) chips. The consistancy works well and they set up with a nice shine. Yes!! We do that too! It does make the chocolate more workable! But be sure not to use too much, or the chocolate wont dry! Why not just get a tub of caramel dip and use that? It's in the produce section, normally by the apples. I think the name is J. Marzetti's or something like that. It's a thick dip so if you're going to have the apples pieces on sticks, you could dip them in this dip & just place them on the tray. It tastes great & would definately be easier on you! Good luck. do you think these would turn out if I made the caramel bite a day before a party? I am worried the apple won't be good, but I am wondering if somehow the caramel will protect it? Help! Caramel dip won't work because that stuff doesn't "set". I've noticed the caramel dip also just kind of "slides"around on the apple, too. I think the wilton candy melts peanut butter disks would work great!! Candy melts are super easy to work with too! Have you tried making your caramel from scratch instead of out of a bag.. Taste so much better!!! I have never tried, but I'm going to have to now. This post has been so popular, I think I'll do a follow up this year with everybody's new ideas. Thanks! If you take Sweeten Condensed Milk and boil it about an hour it turns into a dipping caramel. When making your butterscotch apples, take a bag of butterscotch chips and a cup of peanut butter, melt in the microwave for about 2 minutes, stir after 1 minute. I make rice krispy treats using these 2 simple ingredients and they are sooooo yummy!!! When you are melting caramel candies, add just a bit of milk. This keeps it from burning so quickly and also makes it shiny when it cools! Can the candies apples (red outside) be made the day before? If so, would you store them in the refrigerator or not?? Apple slices and Carmel dipping sauce...much easier! I tried doing the caramel apple bites for our Halloween party last year, never worked out. I did the whole melon baller thing and everything. I tried it a number of times without success prior to the party and reluctantly finally gave up. I ended up just putting out the little apple balls that I did with the melon baller and the melted caramel to dip them in. Everyone still loved it, but I was disappointed. I kept the apple balls in cider to keep them from turning; people always say that you need to use something with citrus, but you really just need to keep the air from getting to them. I kept the melted caramel in a chafer over sterno to keep it warm. I just did the caramel apple bits. I used the caramel dip and dipped the apples in it then in crushed up peanuts! Absolutely Devine!!! Epic fail!!! :( I used the Kraft caramel squares, made sure my apple bites were nice and dry but like a few have said, the caramel stayed put while the apple popped right out. I even sprayed the tray I placed them on with a fine coating if Pam and at one point I realized what was going down I stuck them in the fridge but to no avail. Now it's back to the store for Plan B, on what to take to my daughter's trail ride/cook out tomorrow. I'm sorry you had to make another trip to the store. I hate that! I've never tried the Kraft squares, but I didn't have a problem with the apples popping out with the kit I used- just with it pooling at the bottom. I'm going to do a post this fall where I experiment with everyone's suggestions. I'll keep you posted as to what I find to be most ideal. Why not place them on silicone sheets or parchment paper? I failed, too! I tried coring the apples then cutting them into quarters. Stuck them on a stick then spooned melted caramel onto the channel left by the corer. I sprinkled the caramel with mini choc chips, and some with the new teeny tiny marshmallows. All the caramel (and toppings) slid off the apples. I really think the problem is less with the caramel and more with how the cut apple doesn't give the caramel a good way to stick -- it's too wet. If you have a cake/candy shop around you they should sell carmel in a big chunk that you can cut up and melt...that is what I use to coat pretzels with and never burns (I melt for a 1 minute, stir and then put back in mircowave for small increments until completely melted. I also use parchment paper to put the pretzels on after dipping, works better than wax paper and peels right off. You could also try letting them set for a minute before sticking them opposite end into styrofoam. Then there is no pooling. place square caramel on toothpick above apple before melting. wow...well the pic looks so cool...yet all the epic fail attempts in comments are discouraging. Best I can think isbto keep from pooling is to put ice on cookie sheet under the cookie sheet lined with buttered wax paper ..so here goes! ok one apple down...it DOES matter...and the apple needs to he blotted with per towel first looks like the smaller the chunk the better...satisfied with the turn out. buttered wax paper is working for me. I'm having trouble with the caramel sticking to to wax paper as well. I don't mind the pooling, but it's staying on the paper rather than coming up with the apple. I'm throwing them into the freezer to see if that will help. I used the caramel bits from the baking section and double-boiler, so the caramel melting/dipping went well. I use the Kraft caramels and add just a drop of heavy cream ( my local farm has vanilla heavy cream) I added a drop of that to the caramel and stirred every few minutes in a double boiler. 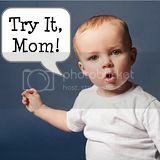 Then take off and put it in a small warmer crock pot on lowest setting and grand-kids dipped in caramel then in peanuts! Yum! Great Halloween meal for kids- take a hot dog and cut it in half length-wise. Repeat that until you have 8 long thin hot dog strips. Do this to as many hot dogs as you plan to serve, then boil them in water on the stove. They will curl up and look like worms. Serve them on hamburger rolls with ketchup- Bloody worms! Why wouldn't you use parchment paper instead of wax? That's what I was thinking, parchment paper would be a better choice. That way you wouldn't have any waxy taste either! for a baby shower, you could also wrap the "baby" in a blanket!! use a toothpick to make a little "print" in the "blanket"! I love how you went through your mistakes. You made it work for us unlike people that seem to make things look easy and they aren't. Keep it up. I tried the candy ones total fail . The juice from the apple melted the candy off and they stuck to the waxpaper need to use a greased cookie sheet . Is there a different in the apple cause I used the red ones . I want to try again I love candy apples and we have a fall festival this weekend I so want to make some. Make sure you put the apples into boiling water for a few secOnds to remove the wax first, all store bought apples are coated with wax! No caramel or anything else will stick to waxed apples! I been there too, and I think parchment paper works best! WHy not just peel the apples?